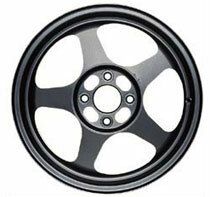 The Spoon Sports SW388 is an extremely lightweight and strong forged wheel for use on the track or the street. The wheel is the traditional spoon flat black. Available in 15 inch (3.88KG) or 16 inch (5.88KG). Available in 4x100, 4x114.3, or 5x114.3 bolt pattern.